MagicFalls Water Effects with many options available to create the perfect atmosphere.Choose from sheet, curtain and rainfall or arc sheet and rainfall effects. 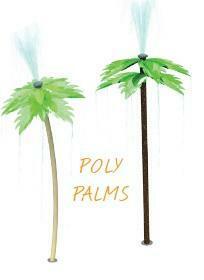 Individual water effects are available in widths from 8 in.–8 ft. Available in 6 finishes: brass, bronze, copper, gray, pewter or white. Waterfalls can be straight, curved or customized. Different lip lengths add to the design freedom available. MagicStream Laminars add dramatic sights and sounds to your poolscape by creating uniform arcs of water that are crystal clear by day and vibrantly colored by night. 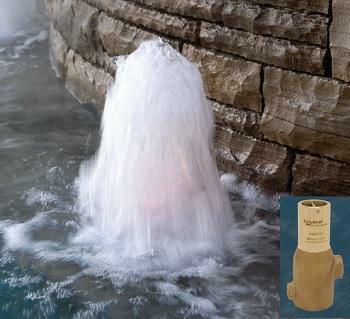 Streams reach up to 7 ft. high and project outward up to 8 ft. into your pool, spa or other water feature. Energy-efficient LED lighting. 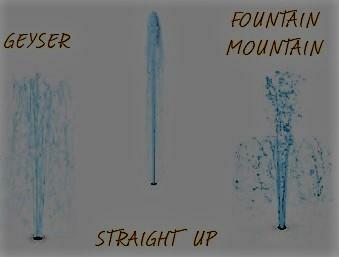 Adjust water streams vertically from 62° to 75° (and left to right 60° total) to create different heights and arc shapes. LED laminars include 100 ft. of electrical cable and are 12VAC. A spectacular display of moving water by day becomes a vivid, mesmerizing light show by night. 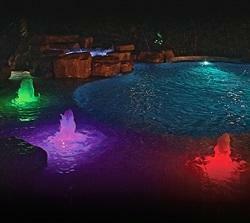 The energy-efficient ColorVision Bubbler with optional GloBrite LED Lights. 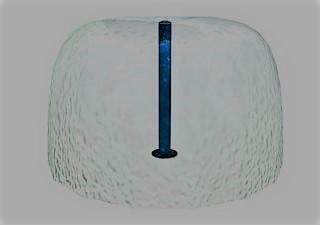 For your water feature or pool. 5 fixed colors; 7 dazzling light shows. 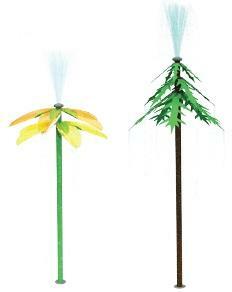 Plume height up to 24 in. Designed for use in 2 in.–10 in. of water depth. Low-voltage operation of 12VAC/15W. Low-flow requirements allow for multiple units per pool. 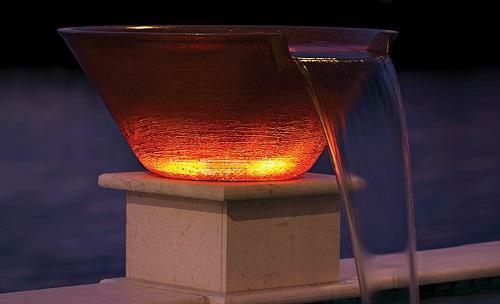 The new MagicBowl Water Effects with optional FireFX LED Lights from Pentair adds dramatic sights and soothing sounds to your water feature or poolscape. The striking design of MagicBowl can be appreciated as an architectural element by day. By night, the safe and energy-efficient LED lights combine with the flowing water to flicker and dance like an actual glowing fire, creating a truly enticing experience. 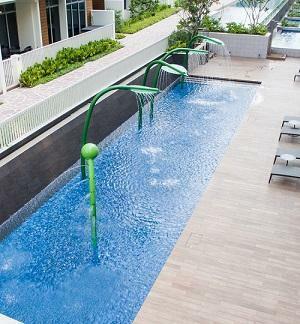 Sculpted from a durable, UV-resistant material, you can choose the finish that best suits your taste and pool environment. And with the low-voltage needs of the FireFX LED Lights and the low-flow requirements of MagicBowl, the combined effect is as efficient and affordable as it is elegant. 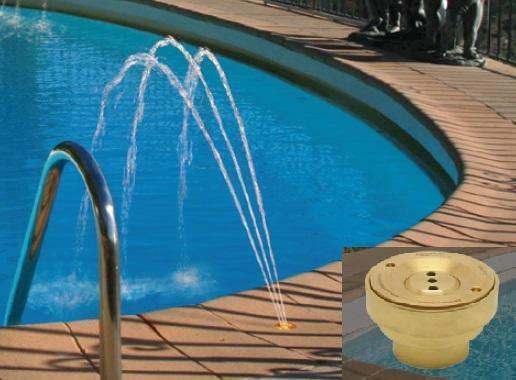 Low-flow requirements allow for multiple fountains and symmetry. Available in either a round or square style and seven stunning finishes Brass, Bronze, Copper, Grey, Natural,Silver and White. This stainless steel jet produces a 1 1/2" diameter water column arching from its flush mounted deck position. 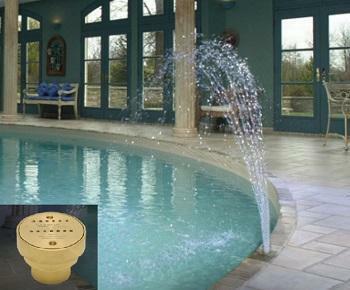 37 central holes produce a evaporative cooling effect for commercial pools. 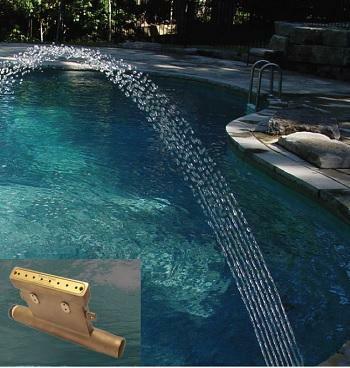 Designed to be flush mounted in a pool, wall, or deck, the crown Jet's effect has 2 rows of angled streams that create a gentle double spray arch into a pool. 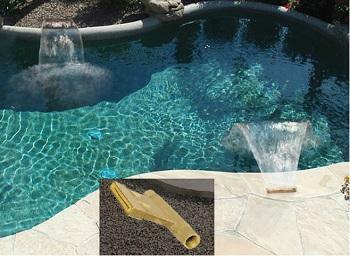 This directionally adjustable jet is designed for flush deck mounting in swimming pools. With the Tristream Jet, 3 gentle, slender, streams of water shoot out of the directional ball to create a triple arch. 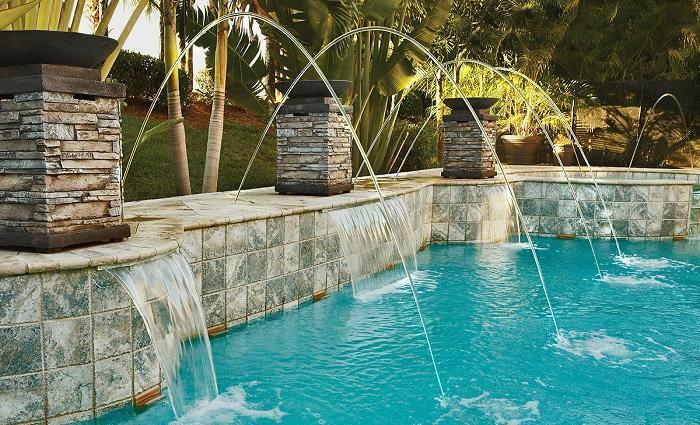 Designed to create a dramatic arching waterfall, this unique jet produces a large mass of unbroken water that comes from a pool deck or wall. 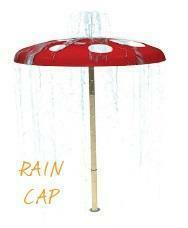 Available in 2 different angles and with or without lighting capablilty. Foam Jets produce a mound of frothy, aerayed water, generating a sophisticated visual and aural effect. 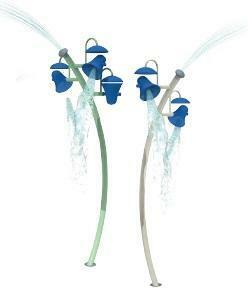 These flush mounted jets can be arranged individually or in a grouping. Available with or without lighting capablilty. Eight sparkling streams produce a wide, gracefull arch, with substantial mass and form. 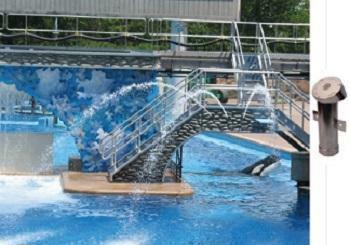 This jet can be mounted in pool decks or walls at varing angles for a varying spread and height. 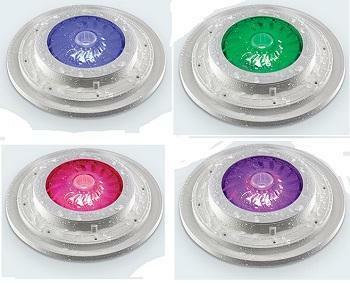 Available 3 interchangeable plates and with or without lighting capablilty. Looking for something different? Something Special? 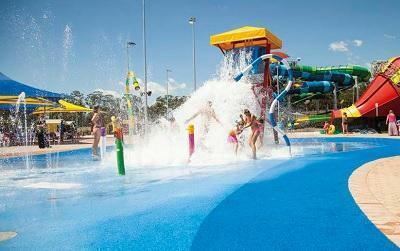 A Spray Feature to suit you needs? 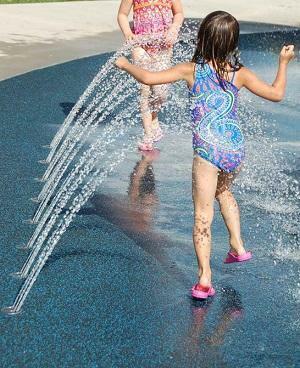 We work with Dynamic Construction - Saskatchewan agents for Waterplay Solutions Corp. to find Waterplay Features that will suit you needs. Contact Us for details.